Is your website killing the member experience? 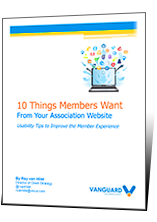 For many members, their perception of your association is linked to what they think of your association’s website. So if your website doesn’t follow web best practices and usability standards, you might be keeping them from getting the full experience from your association. Don’t let poor usability keep members from getting the most member value. Get your eBook today and find out how to increase member value through improved website usability.